Born Pretty Store has a lot of studs, and specifically neon ones. You've seen the round ones and the square ones, but today I will be showing you some neat petal shaped studs! These come with six different colors (and in pastel too). I've shown all but the yellow in this mani over Pure ICE Scandal (it is actually a very dark brown, but it's nearly black). They do stick out a little if you have a high C-curve like I do and put them too close to the sides. I didn't try to bend them, but I did apply two thick coats of Seche Vite over the top and didn't have any issues with them coming off. The studs are $7.59 USD for 300 pieces and they are so much fun to create manis with! I love the bright colors! They don't bleed, and they are a great size to be able to fit multiple studs on each nail. 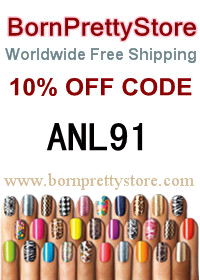 If you shop at Born Pretty Store, use my coupon code ANL91 and you'll get 10% off your order. Plus, they ship worldwide for free!